The FAE are coming ... to a screen near you. 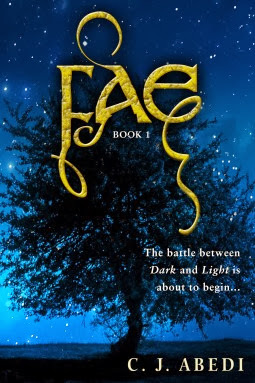 Do all of you YA fans know about FAE from author C.J. Abedi? Published digitally this past summer, the fantasy - now available in paperback - was an instant hit, a twitter, facebook and pinterest phenomenon - that cover is pretty pin-worthy - and is being hailed as the next Twilight. That kind of buzz must be what lead Ridley Scott to option the novel's film rights. According to Deadline, the prolific producer/director has added Fae to his humungous roster of upcoming films and television shows including the adaptation I can't wait for - S.J. Watson's Before I Go to Sleep - starring Nicole Kidman, Colin Firth and Mark Strong. No details yet on who will write and direct the film but C.J. Abedi has scripting experience so perhaps they'll do the adapting themselves. C.J. Abedi, you see, isn't 'an' author; C.J. Abedi is the nom de plume for a pair of writers, sisters Colet, a writer and executive producer, and Jasmine, an entertainment lawyer, writer and entrepreneur. Learn more about the pair and their books at their site, The Fae Are Coming. There are two more books planned, the second in the series The Dark King, is set to come out May 6 of 2014. Who knows? With the kind of success FAE has garnered so far, the trilogy could play out on screen as several films ala what Peter Jackson is doing with The Hobbit, and the filmmakers are planning for Mockingjay, the third book of the Hunger Games. "Caroline Ellis' sixteenth birthday sets into motion a series of events that have been fated for centuries. A descendant of Virginia Dare, the first child born in the lost colony of Roanoke, and unaware of her birthright as the heir to the throne of the Light Fae, it isn't until Caroline begins a tumultuous relationship with Devilyn Reilly that the truth of her heritage is revealed.Devilyn is the only Fae who is both of the Light and of the Dark, and struggles to maintain that precarious balance to avoid succumbing to the power of the Dark within him. He is the only one who can save Caroline from those who would destroy her and destroy all hope for unity among the Fae. He promises Caroline that he will protect her at all costs, even when it means protecting her from himself. I wonder if the sisters have started thinking about who they'd like to see as Caroline and Devilyn? Since they're Hollywood pros I'm betting they have very specific ideas. How about you, who in 'young Hollywood' do you see playing the parts?